That’s the question I asked of myself after reading Gary Wolf’s intriguing profile of Piotr Wozniak, the Polish inventor of the software program called SuperMemo that can help you recall things you’ve memorized at close to 90 percent. Forever! The profile goes on for 6,000 words. And do read it. It’s a terrific piece of reporting on a man who has become prisoner to his nearly perfect memory. But I can spoil the how of it in just a couple of paragraphs. For most of us short-term memory has a lifespan. That lifespan varies per individual, but memory’s fade is predictable. What Wozniak discovered… or really, rediscovered… is that the best way to keep a memory is to be reminded of it just as you’re about to forget it. Keep the reminders properly spaced and you can sell your library of books on eBay. But here’s the kicker; memory fades in waves that are especially steeply-sloped early on. (See the diagram on the left). To keep memory sharp you have to be reminded at just the perfect crest of forgetfulness. 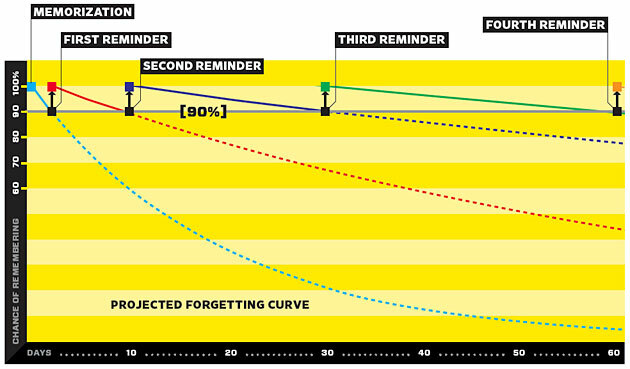 With each properly-spaced reminder the wavelength of memory grows longer over time. The phenomenon is well known and now called ‘the spacing effect.” That’s it diagrammed on the left. It was first identified in the 1880s by a German researcher named Hermann Ebbinghaus. Ebbinghaus memorized a series of nonsense syllables and rigorously measured how long it took to forget and then relearn them. His analysis led to the first description of the spacing effect. But wait a minute you say, American educational theory scorns memorization as unhelpful and uncreative. Bjork for instance, has studied the oddity of the elderly who can often remember distant events with perfect clarity, but forget what they had for lunch. It’s small proof that it is recall that fades, not memory. The result was the effective if not always easy to use SuperMemo. You read that right, Wozniak has been loading data into his brain for decades and… using SuperMemo… has kept up the repetitions required to never forget it. He doesn’t foresee leaving Poland because the travel would disrupt his routines. He keeps himself in fighting trim in no small measure because his body houses his mind. For the same reason he avoids travel in Poland because the local motor vehicle accident rate is so high. I’ll end where I started; as an informal learner what price are you willing to pay to never forget what you’ve learned?